Hong Kong’s Wanchai district has long been known for its dubious nightclubs, but a new wave of hipster cafes and quirky bars is fast turning the neighbourhood into a place to see and be seen. The latest, most intriguing addition is Ophelia, an unabashedly opulent bar with dark and moody interiors by the Australian-born designer Ashley Sutton who first made his name with a handful of seductively themed watering holes in Bangkok (Maggie Choo’s is always top of our must-visit list). For Hong Kong, Sutton wanted to reflect the territory’s iconic history, albeit through a somewhat cinematic lens: think opium-den-like secret hideaway. The entrance is disguised as ‘Mr. Wong’s Aviary’, a mock bird shop embellished with jade green ceramic tiles and a ceiling festooned with black birdcages. Sweep aside a curtain to find a dramatic 12-meter-long copper-dipped steel bar framed by two custom-design lounges upon which a pair of cheongsam-clad ‘muses’ recline seductively. Although the interiors are semi-open-plan, plush velvet bespoke-design sofas and ottomans are arranged to create cosy intimate clusters delineated by screens and semi-circular gateways, the latter a nod to the traditional entrances to Chinese parks. 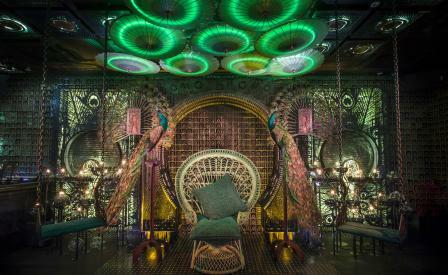 The designer’s non-conformist spirit is also on show throughout with a subversive riot of peacock feather artworks, 600,000 ceramic wall tiles hand-painted with the pattern of a peacock feather’s ‘eye’, exotic swings and an enormous cage for nightly performances. Our cocktail of choice: the sultry ‘Cheongasm’ with tequila reposado, house-made pomegranate cordial, La Quintinye Vermouth Royal Rouge, lemon, lime and cinnamon mist.